The use of chemical and biological weapons is a violation of international law. Their use was banned by the international community following World War I. The development, stockpiling and transfer is prohibited as well. The treaty on the non-proliferation of nuclear weapons aims to prevent the spread of nuclear weapons and their technology while working toward complete disarmament around the world. Not all countries have signed the non-proliferation treaty, and while the threat remains low, there is still a need to be vigilant about nuclear and other types of weapons the international community has condemned. Within the Marine Corps, there are specialists charged with training others to survive in an environment where there may be chemical, biological, radiological, or nuclear (CBRN) threats. When any of these hazards are present, CBRN defense specialists know what protective measures to take in combat and other situations, and they train other Marine personnel in these techniques. The military occupational specialist (MOS) number for this job is 5711. These specialists conduct and supervise CBRN defense training tactics. This includes the monitoring, surveying, and reconnaissance of chemical detection and identification, as well as biological agent collection and sampling and decontamination of personnel, equipment, and casualties. They also train first aid personnel in individual protective measures against CBRN. CBRN defense specialists operate within the unit's combat operations center to assist CBRN defense officers to advise commanders and see the mission to successful completion, while providing CBRN defense. 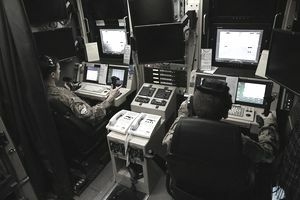 During a combat situation, these specialists' duties may include giving tactical information to the commander about radiation exposure status, apprising the commander about the location of contaminated areas on the battlefield, and updating the commander on the unit's CBRN defense equipment. These specialists are also tasked with maintaining and servicing CBRN defense equipment and supplies. In order to be eligible to serve as a CBRN defense specialist, a Marine needs a general technical (GT) aptitude of 110 or higher on the Armed Services Vocational Aptitude Battery test (ASVAB). They'll need to complete the basic CBRN defense enlisted course at the Marine Corps NBC School in Fort Leonard Wood, Missouri. You'll also need to be able to qualify for a secret security clearance, which requires a background check. A history of drug or alcohol abuse may be disqualifying for this job. The training for CBRN defense specialists includes basic skills, hazard prediction, contamination avoidance, and decontamination practices. In addition, these specialists must be eligible for a secret security clearance and must be U.S. citizens age 18 or older. They need to have normal color vision. Due to the nature of their jobs, anyone who has hypersensitivity to protective clothing or immunizations would not be eligible to be a CBRN defense specialist. Any respiratory condition that would make wearing a mask problematic would also be a disqualifying factor. Due to the nature of this job, there isn't a specific civilian equivalent. You may have the skills necessary to work as a trainer for first responders or law enforcement personnel.